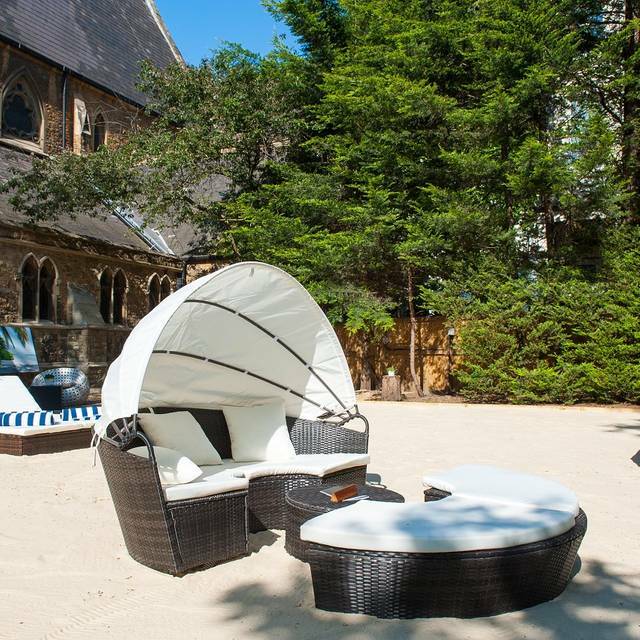 "Tucked away between Kens Bar & Garden and St Stephens Church as a backdrop; enter into a setting so calm, enough to forget that you’re still in Central London. 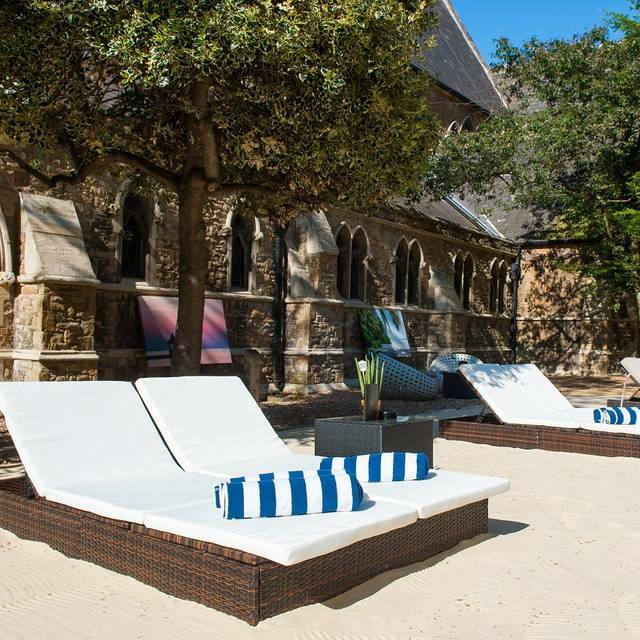 The beach is furnished with a mix of sun loungers (for those looking for a tan), cosy cabanas and few beach sofas for a couple or group of friends enjoying a day out. If your purpose is to soak up some sun, look out for the ‘beach boys’ to provide you beach necessities like beach towels, flip flops, sun tan- all to help you relax. 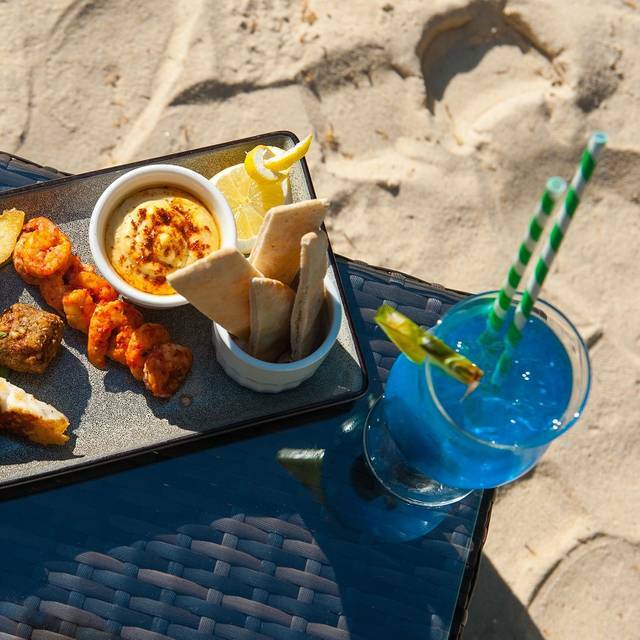 Share a platter with cuisines inspired from the Mediterranean whilst sipping on a variety of 3 litre sharing bowl cocktail or individual fashionable mixers. 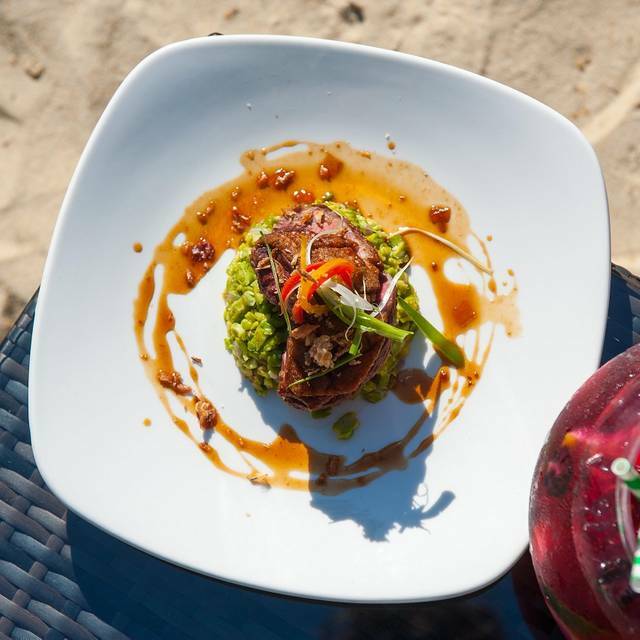 Healthy options available for the ones on a beach body diet. When we arrived the staff were perplexed, and a little obtuse, as it turns out the Beach Club is completely nonexistent and they still have the winter igloos installed! Nice quiet location, food ok could be more choice - what let the place down was the service it was terrible! Went here for my birthday with friends, the service here was absolutely atrocious. Had to wait 45 minutes to even get our orders taken, and by then we had had to call a server over to our table (multiple times, I may add). We we told two different times, twenty minutes after the fact, that the two different drinks we ordered could not be made. This information should have been relayed to us while we were ordering the drinks. No perfect ambience or quality of food could make up for the service we experienced. However, I will say that the food was overpriced and the setting was underwhelming all things considered. I was able to book outside seating for two, but upon arrival I was told that the whole outdoor area was reserved for a private party and so my partner and I had to find somewhere else. The staff were very unhelpful in dealing with the situation and could not offer an alternative place to go. Luckily we both live in the Gloucester Road area, although if we had been travelling from elsewhere in London we would have been extremely unhappy. I have simply falling in love with this place as it is a little bit of heaven if you want to feel sand on your feet in the heat! Waitress not friendly or interesting on doing her job. Avoiding eyes contact to get the bill and we end up having to go inside.